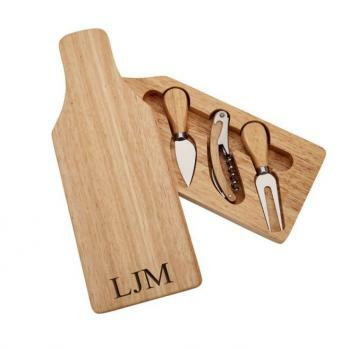 Some might say this item is all you need for sustenance – if your diet is wine, cheese and bread – because this cute bottle shaped cutting board also includes 3 tools hidden inside the sliding top. That’s right. Slide the top and inside are a cheese knife, cheese fork and a cork screw wine bottle opener. The 13” x 4.75” board is solid rubber wood (a renewable wood source) and the tools feature stainless steel blades and rubber wood handles. Gift boxed.